Phil is a volunteer lemur keeper at the Howletts Wild Animal Park in the United Kingdom. 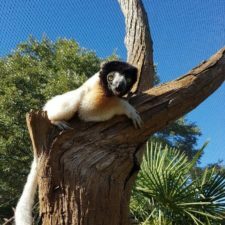 He blogs for the Lemur Conservation Network about all things related to lemurs as well as the trials and tribulations of working in captive lemur management. 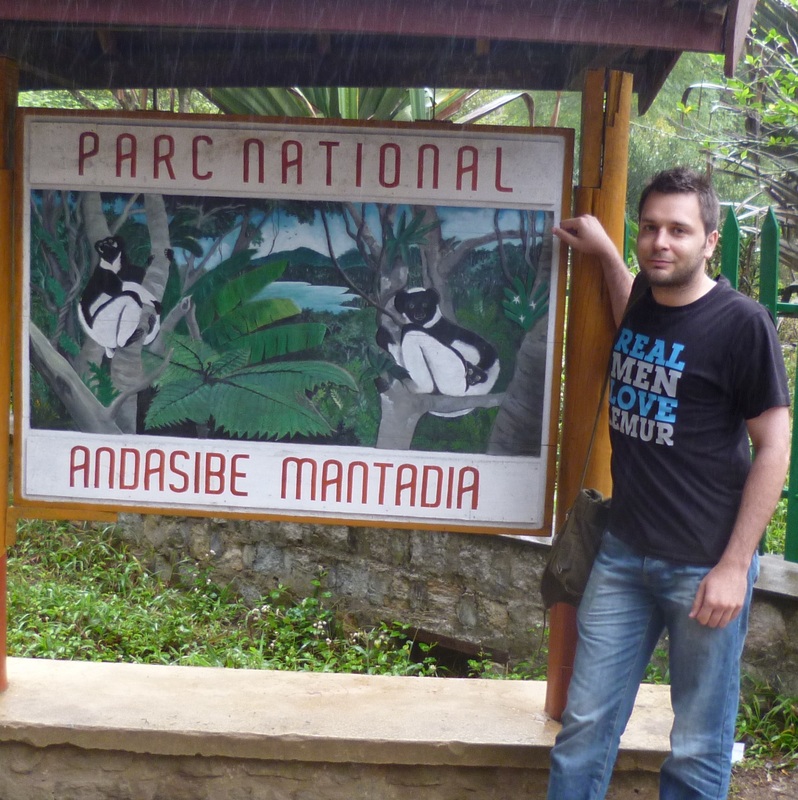 Phil visited Madagascar in 2015, and completed a half-marathon for lemurs last year. The three red-bellied lemurs at Howlett’s. 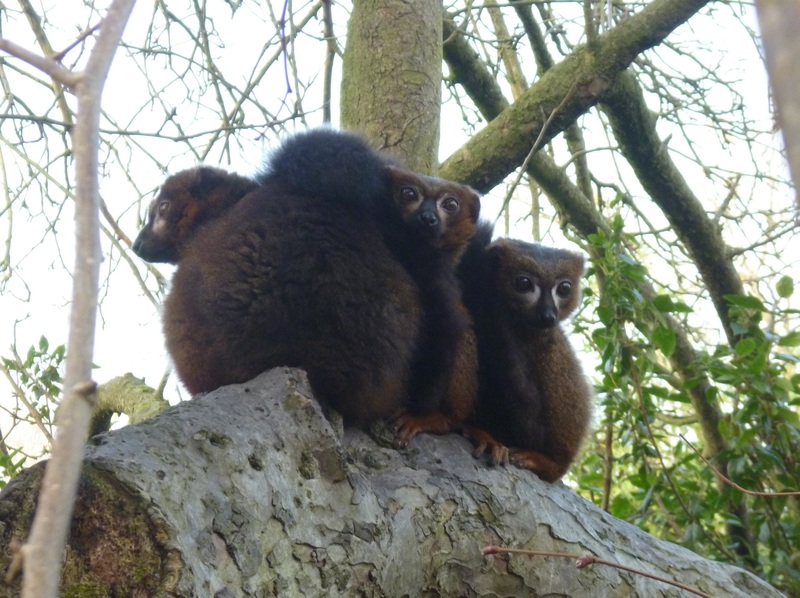 Although the shyest of Howletts’ lemurs, the red-bellied lemurs are arguably the most attractive due to their teardrop markings, and perhaps the most charming. Whilst the other lemur species enjoy stalking the paths and showing off sunbathing, the red-bellies prefer to lead a peaceful existence. They can usually be found cuddling in the shed, or in one of their favorite spots up a tree. It doesn’t matter how hot or cold it is, they love to curl up together and can often be found grooming one another. 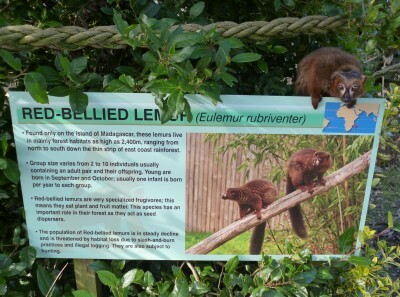 To be honest it took me over a year to figure out which red-bellied lemur was which. They are largely identical besides one key feature – how greasy the hair on top of their heads look. Red-bellied lemurs have a scent gland there, thus the moisture. If you watch them outside then it won’t be long before you see one rubbing his head on a tree branch. He’s not scratching, but rather leaving his smell behind. Hamish looks like he’s come back from an Elvis tribute night and so I’m able to pick him out easily. In contrast, Teddy has far more ruffled fur. Where one is, the others can usually be found, albeit as brothers Hamish and Angus share a slightly closer bond. Unfortunately for the three of them, they are our lowest ranking group. Without a lady to stick up for them they are sometimes chased off at meal times, and in the minds of the ruffed lemurs, they only get the boring leftovers. However, when a ruffed or crowned isn’t looking, I ensure they get some fruit. 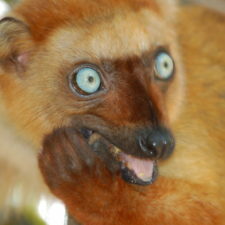 The red-bellied lemurs have many funny little quirks. For instance, they get confused when I change out of my motorcycle gear and alter my appearance. That results in lots of ‘sneezing’ and staring at me with their heads at an intrigued angle. When they’re hungry (which is pretty much always) they’ll stand on their hind legs to see inside the food bowl and work out what they can steal before anyone notices. I have been caught out more than once by their lack of toilet etiquette, and they can be very difficult to get in at night! Red-bellies are active both day and night. 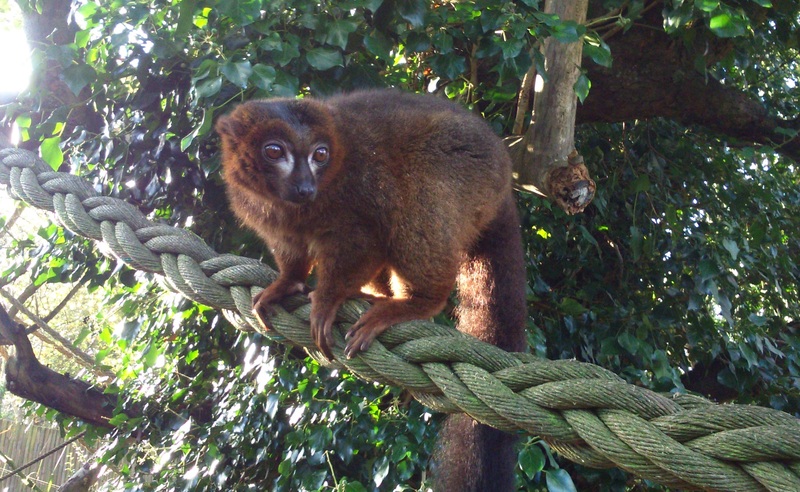 In the wild, red-bellied lemurs are highly frugivorous and are important seed dispersers. At Howletts, the red-bellies receive more vegetables than fruit, but this means they get their required nutrients and avoid weight problems. Their favorite time of year is when the enclosure’s apple and pear trees bear fruit; this also encourages them to forage naturally. 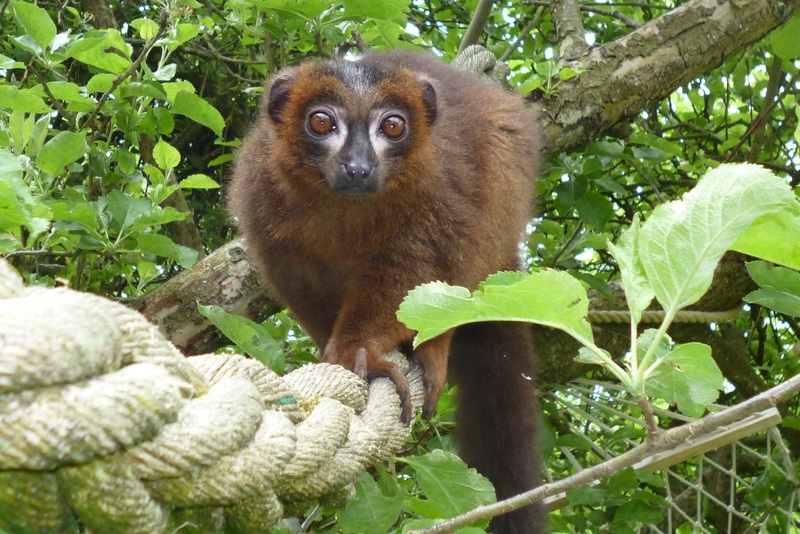 Being ‘true lemurs’ makes it easy to determine gender in red-bellies. They are sexually dimorphic and so females have distinctive cream chests and don’t have the slick hairstyle. Interestingly, males carry infants almost as much as the ladies do! Groups are normally made up of parents and their offspring but can be as large as ten individuals. Back in Madagascar, red-bellied lemurs are considered ‘Vulnerable’. 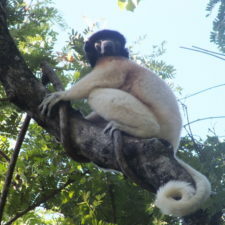 They share a similar range to black and white ruffed lemurs, in the higher altitude rainforests of Eastern Madagascar. I have been lucky enough to see a couple of red-bellies in Ranomafana National Park, but like their cousins at Howletts, they were spending their late-morning resting. I thought they were brown lemurs but hey, I’m not going to dispute a local guide. Hamish showing off his sign. 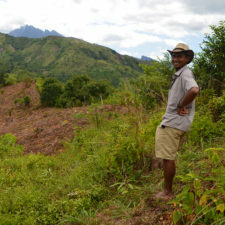 Numbers are decreasing and for similar reasons to many other species – habitat loss due to slash-and-burn practices and illegal logging. Howletts’ charity The Aspinall Foundation manages a large protected area near Andasibe, thus giving the red-bellies of that region a little more hope whilst educating locals about the value and uniqueness of the nearby fauna. Altogether the red-bellied lemurs form a key part of the walk-through’s harmony for both its inhabitants and visitors. Although not as brash or playful as their neighbors, they provide a constant soundtrack, look particularly cute, and further demonstrate just how special and diverse lemurs are. 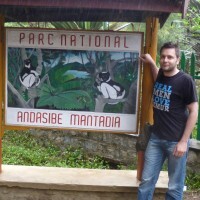 Phil volunteers at the Howletts Wild Animal Park, which is run by the Aspinall Foundation, a nonprofit member of the Lemur Conservation Network.